How do I get more followers on my blog? The 33% rule for blogging is a good one, ie., 33% gathering followers, 33% writing, and 33% socialising and interacting. Why are some blogs more successful than others? Where do they get all their followers, page views and visitors? Why do some wonderful writers have so few followers, while others with less well written blogs have so many? Most new bloggers will google this endlessly, (probably second only to “how can I make money from my blog?). The number one answer they will read is “write good content”. Well listen up new bloggers. That’s not strictly true. Content is not what makes a successful blog, although it will make you more successful than others. 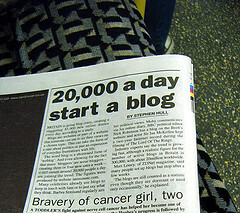 No, in my opinion what makes a successful blog is the many different things a blogger does before pressing publish, and the efforts they make afterwards “off blog” to promote their post. This entry was posted in Blogging Tips and tagged Authors. Bookmark the permalink. Good advice, but I also had help from a certain kindly Ape, who posted something I wrote! Thanks for this piece. It was very helpful. Thanks for sharing this article. It’s full of good advice. I think I spend only 5% of my time blogging. The rest is reading other blogs, socializing, and formatting posts for Authors to Watch. I definitely need to be more consistent with my blogging.